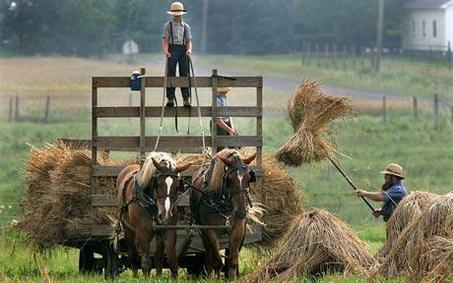 When the kids were younger we used to go Amish Hunting. I miss Amish Hunting. It’s a very soothing and relaxing activity, good for the soul and refreshing to the spirit. We’d often go Amish Hunting after a trip to suburbia, a trip full of shopping and errands on a weekend day. Typically on those days, the kids would fall asleep in the back seat as we were headed home and being good parents who wanted to take advantage of those precious moments of quietness, we would go Amish Hunting. There is a relatively large Amish community just south of us. 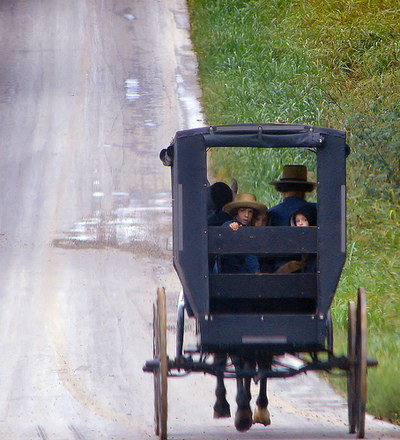 When you are Amish Hunting you need to have good tracking skills, honed over many years and many miles driving through the country side with sleeping children in the back seat. Some clues that you are approaching a good Amish Hunting ground; lots of white barns, clothes lines full of men’s dark pants and blue work shirts and women’s dresses flowing in the breeze, plows being dragged through the earth by large work horses, beards and bonnets… and of course, the symbolic black horse-drawn buggies. 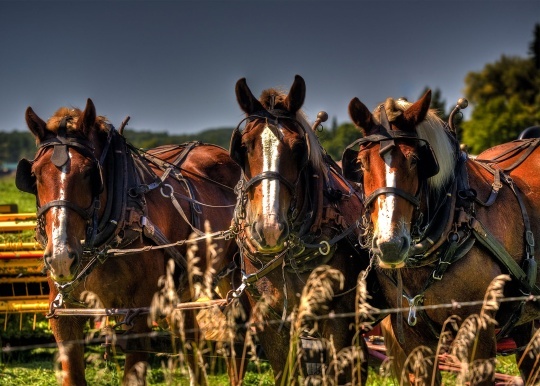 It takes some time to develop the necessary skills to recognize these signs, but once you learn them, you too can spend valuable time Amish Hunting. Just remember, when you are Amish Hunting, it’s okay to shoot the scenery, but it’s not okay the shoot the actual Amish… with your camera, that is. Amish people do not like to be photographed. Some claim the reason is that the Amish believe the photograph steals their souls. From what I gather this is just an urban legend and the proper reasoning is that the Bible tells them it is a sin and forbidden to have a Graven Image of oneself. I think it is okay to take a picture of an Amish person if he or she is not aware of the photo being taken and is not posing for the camera. Here’s my advice though; when you are Amish Hunting, just don’t take any pictures. Instead keep to yourself and spend your time basking in the scenery and the peace and quiet and solitude. If you need pictures of Amish people go to the mall and buy a book or a calendar, there are plenty of those to be had. I’m not sure how we coined the phrase Amish Hunting but it’s a phrase that has stuck in my family’s lexicon. We have discovered a few interesting things during our Amish Hunting trips. There is a wonderful Amish owned store called Millers General Store which sells lots of great baking goods and other grocery items. There is no electricity in the store so it is lit with gas lamps and the refrigerators are powered that way as well. One day on a rare weekday Amish Hunting excursion, on a Tuesday afternoon, we drove past a large congregation of Amish people celebrating. After a little research later that day we discovered that Amish weddings are traditionally held on Tuesdays and Thursdays. The kids swing set that graces our yard was purchased from an Amish fellow who hired a driver to deliver it to our property and assembled it for us. There used to be a great ice cream store we would stop at, since closed down, that was often frequented by Amish families with their children. Farther south, of course, is the wonderful city of Shipshewanna, part Amish community with its famous flea markets and tractor pulls and part tourist trap with its restaurants and t-shirt and souvenir shops. Mostly though, Amish Hunting is just what it sounds like… driving around in a scenic, idyllic place, admiring the beauty of an area where time has seemingly stood still, where family and community and rural heritage are able to survive even though the materialistic temptations of the modern world slowly encroach. I’ve always felt a little strange staring and gawking at these people and wonder how they feel as their communities have become a draw for people trying to get a break from their usual suburban and urban landscapes. But these areas continues to enchant me… its part admiration, part curiosity and wonder, part fascination with a people who us regular folks in the modern world have trouble understanding. It’s Amish Hunting and I’d encourage you to try it some time. Now that the kids are growing up, we don’t go Amish Hunting very often anymore. Their daily activities keep us occupied and there just isn’t much time these days for lazy afternoon drives. That’s okay… it’s the way life ebbs and flows and in due time there will be more opportunities available. For now, I’m pretty confident the Amish are not going anywhere. It’s funny, you can read over something you write a thousand times and not catch what should be obvious stuff like that. That’s what a good editor and a 2nd set of eyes is for, right? Of course, you look at some of those beards and I would guess it IS some strong facial hair! This all made me start to wonder why Amish men have beards but not mustaches, so I looked it up and found this: “A long beard is the mark of an adult Amishman. Mustaches, on the other hand, have a long history of being associated with the military, and therefore are forbidden among the Amish people.” Interesting! The Amish communities are fascinating – can’t help but think they have a better grasp on life than us modern folk. I find it incredibly fascinating. I don’t think I could live that way though!! Great read…it is so wild how things are so much different in other parts of the country even though we are basically the same. Don’t think I have ever seen any Amish….I know I haven’t around here, but don’t think I have on any trips either! I think most of the largest communities are in the northeast and midwest areas, but there are some southern states with communities as well. We don’t have Amish in our part of the world, but I think it would be very interesting to see their ways. We have Hutterites, and while they are similar to the Amish in some respects, the Hutterites drive big pick up trucks and use modern farm machinery. I’ve not heard of Hutterites… will have to google that. I live close to Mennonite country and there is something peaceful being around these peaceful folk. We have Mennonite communities here as well, not really sure the difference between them and Amish. Seem to be quite similar in many ways. We have Amish up north of Indianapolis, I seen a whole mess of them once in the Caballas sporting good store, which I found odd for reason. I didn’t see any horse or buggies in the parking lot so I wondered how they got there….no bus either……hmmmm. Thanks Bass, I think there may be some less strict groups that do drive as well. What a beautiful post. I hear your nostalgia in two levels: one with your enchanted views into Amish Country, and two with the rememberance of those drives with your sleeping children. I’ve been to Amish Country in Pennsylvania a few times, and am always in awe of the beautiful quilts, homemade jams, and lack of electricity — and a little nervous too. I wish I could talk to some of the women walking around, but of course they can tell I’m a “Westerner?” (Does that term work?) and tend to look down when we pass. It’s just so different, and I want to know more about it. I just love the image of you and your wife driving your little ones through the country. Beautiful. Hi, thanks for visiting. Glad you liked the post. There is a term for us “non-Amish”. I can’t think of it right this moment. I giggled through this post because when one says hunting, of course I assume the worst- blood gore and all that jazz. Great read my friend! Thanks ED! You know I always have to have a gimmick in my posts! I don’t live anywhere near the Amish. In fact I don’t think I’ve ever seen an Amish in real life. Still not sure if they’re real or just an old legend like vampires and werewolves. The Amish are alive and well and thriving. Not sure about vampires and werewolves. They appear to be thriving in Hollywood at least. Very good read. I agree it is astonishing people can maintain that old world life in this day and age. Each age has its pros and cons. Sometimes I think we’d be a lot better without all the gadgets we have. We’d get a lot more sleep too! Hi TO. I agree that maybe we’d be better off although I certainly enjoy my electronics. I guess its finding the balance between the two that makes people happy! That was a fascinating article. I have never heard of “German Carpenters.” I can tell you the Amish dress much more simply, usually black pants and solid color shirts on the men and solid color dresses on the women. All of it is fascinating to me!!! Such an interesting post! I really enjoyed the pictures and reading it…though, I wish you would have photographed one of them anyway. So, is this something one can convert to and the Amish welcome newcomers with welcome arms and teach them how to support themselves, living off the land? I’m guessing you just have to be born into this, and then that makes marriage prospects somewhat limited? Are they paired with someone while they are young or do they get to pick? Curious. You have not posted in weeks. Did the Amish read this and kidnap you for stealing their souls? Yes, but I escaped this morning. Stole a horse and buggy and rode out of town, taking pictures and stealing souls along the way… no, really I can’t blame the Amish, just been having a little writers slump. Of course I’m the first to get after everyone else when they don’t post for awhile… guess I better get typing!! Thanks for checking in! We had Hudderites where I lived. They’re kind of like Amish. They made great bread. We used to go to their colony sometimes and trade candy bars and coffee for bread and wine. They make their own. Awesome wine too. That’s cool. I tried to make wine once… didn’t turn out very well! !